TWHostingprovidesTwo Great Packagesto the Business Owner - Its all you require! Hellonetalso provides professional Hosting, and Web Site design services to the general public, using the very latest design standards available. Enter Hellonet!We give our Business Members, but a single package - at low cost! Our packages include everything required to display their services, or products Professionally. Hellonet providesMultiple Listing SitesSome locally orientated. We provide exposure in the smallest Village in South Africa! There is no comparable service on the Internet - period! 1. If you have existing hosting accounts:Hellonet can transfer all your domains to our Servers, and host two "DOMAINS" at no "COST" - Further domains will be hosted at onlyR30.00per month. Or you may leave current domains with your present service provider if you choose. We suggest you use the Hellonet Hosting Service and save"Mega-Bucks"
Your Web Siteis your calling card! Like your letterhead. It is your window informing the Public that your business is efficient, successful and reliable! Your Internet Address and the content displayed on your web site must be of the highest quality. Prospective Clients are becoming selective! They rarely support service providers offering Web Sites ofinferior design. Pro-Pack:Includes a professional domain and Website, built to Members requirements. Including Member selected graphics and content. Secure Socket Layers (SSL) - and Shopping Carts are not standard features of this package. These are only required if clients make "on-line" payments for services rendered or products bought - using a credit card. Without these facilitieslimited or no database will be needed. Hosting fees for this package is billed annually. Monthly payments are possible at a surcharge of 7.5% to cover additional collection and bank fees. TO ORDER:Click Here: - complete the form presented. Hellonet will respond without delay. 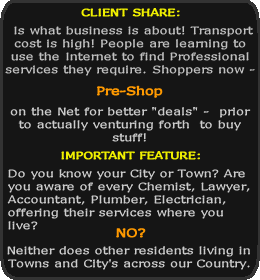 An Internet Shop:A second income generating business - at a small monthly cost to the Shop Merchant. Your Web Siteis your calling card! Like your letterhead. It is your window informing the Public that your business is efficient, successful and reliable! Your Internet Shop and the content displayed, must be of the highest standard. Shoppers are becoming selective! They are demanding high quality products - They also want to shop from high quality E-Shops. The public will not buy, or pay for products, offered on inferior and insecure Ecommerce Shops! High Quality E-Shopscan cost manyThousandsto design, build and maintain. Hosting fees for Ecommerce Web Sites, without any Extras, cost hundreds per month! Your E-Shop:will be a fully functional Internet Shop. Content, categories, products and prices must be provided by the Member. Graphics should be provided by the Member; But Hellonet will assist you all the way! A Secure Socket Layer and Shopping Cart is included to facilitate "On-Line" payments. The Shop is Database driven with a password protected "back-End" - Allowing updating and editing of content at will by the Member. Hosting fees for this package is billed annually, in advance. Monthly payments is possible at a surcharge of 7.5% to cover additional collection fees. HMS Special - We help "low-budget" or struggling Businesses owners! Graduates and any Registered Business:may want to consider one of the Professional Packages offered here onTWHostingas a more upmarket alternative. 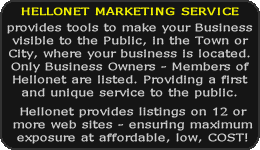 Your Web Site receives fantastic, multiple internet exposure on our many listing sites. You also qualify to use the Professional domain name Suffix( .pro )- or you may use any other domain name you choose, if available. TO ORDER:Click Here: - and fill in the form presented. Web SitesCreated, byHellonetare of the highest quality available. Design StandardsConform to the World Wide Web Consortium(W3C)guidelines. Qualityis Supreme - The website you are viewing now - is a prime example of our work! Content Management Systems - (CMS)You have control of your dynamic, inter-active site. Add/Edit pages, content and graphics at will. From a password protected interface, using standard browsers. You get everything - including header / footer graphics : OnlyR6500.00. Merchant E-ShopsR9500.00fully operational. Cost of additional modules - like (SSL) and "on-Line" payment services - can be assessed when Client requirements are known. Page Contentmust be provided by the Client. Graphics:If designed and created by Hellonet; will costR200.00 per item. Graphics:Provided by Clients must be sized at maximum 350x260 pixels. Graphics provided, which approximately conform to sizes requested, will be cropped at no charge. Click Here:To complete a short enquiry form : Hellonet will contact you soonest.